Jarrow Roofing made Morpeth work hard for all three points as the Highwaymen recorded an eighth consecutive win. 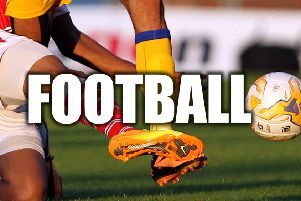 With title rivals Marske United’s game with Newcastle Benfield postponed, it gave Town the chance to move 19 points clear at the top of EBAC Northern League Division One. They duly took that chance at the expense of Roofing. A sublime Chris Reid strike, Jordan Fry’s close-range finish and Liam Henderson’s goal 15 minutes from time cancelling out Liam Anderson’s brace for the visitors. Morpeth restored David Carson to the starting line-up as a stable starting XI maintained its nucleus. They certainly got off to a flying start at Craik Park. Three minutes in and Reid scored a strike that oozed class and technique from inside the area. The defender, up from the back for a corner, took the ball down on his chest before lashing a volley into the far corner. That superb goal was a bright spot on in otherwise lacklustre first half as Morpeth enjoyed plenty of possession without finding the killer final pass to create an opening. There were some but the next fell the way of the visitors as Dennis Knight fed Anderson. However, the striker was forced wide by the pass and the eventual shot flew well wide of the near post. Twenty-seven minutes passed before Morpeth threatened again with a David Carson effort looping well over after being teed up by Michael Turner. Defenders were proving potent attackers, with Reid going close again on 31 minutes. The centre-half turned in the box and sent a low drive along the turf. However, keeper Shaun Newbrook got down smartly to turn the ball around the post. Then, out of relatively little, Roofing levelled matters through Anderson. The striker slotted home after Lewis Walton had slalomed through the Town defence. A 41st minute bolt out of the blue, it generated an immediate response as Morpeth restored their lead two minutes later. With Taylor twisting and turning in an effort to create a yard of space in the box, Fry steamed in to fire a shot into the back of the net, taking it off the toes of his fellow midfielder. Despite taking a lead into the second half, Morpeth conceded early on with Anderson the scorer once more. The striker latched on to a loose Reid header back to Dan Lowson – from a long punt downfield – before striking low into the corner. The home side were looking for a response and so nearly found it in the 58th minute, but Taylor’s lashed effort nicked the crossbar on the way over the top. Sub Wayne Phillips, just off the bench, forced a smart low stop from Newbrook in the Jarrow goal as the 66th minute came and went with both sides still deadlocked. Fellow sub Stephen Elliott shot on the turn but straight at Newbrook. The pressure was building against the away side and they finally buckled, Morpeth gaining the decisive breakthrough on 75 minutes from a reliable source. Henderson latched on to a long ball forward before shooting low from a narrow angle. Keeper Newbrook should have had it covered but allowed the ball to squirm through his grasp, and through his legs, before nestling in the far corner. Late drama saw a stoppage time Knight penalty saved by Lowson, following Reid’s handball in the box after the ball had skidded off the turf.